Just fin­ished going through a stack of Real Sim­ple mag­a­zines (anoth­er sub­scrip­tion we have allowed to lapse), and at the back, they have a “Real Life” sec­tion where impos­si­bly ide­al women answer ques­tions about their lives. They are fun­ny, insight­ful, and sure­ly not writ­ten by real peo­ple. But in the for­ev­er quest for stuff to write about, I am going to post some of the ques­tions, and my answers, in an ongo­ing fea­ture. Thanks Real Sim­ple! Just one? I expect stuff like, “My wed­ding ring,” or “My cut­ting wit,” or “The abid­ing love I have for my fam­i­ly,” aren’t in the spir­it of the ques­tion… and those of you who know me might expect me to say it’s our TiVo (start­ing to be more love-hate, actu­al­ly, it is still awe­some but I watch too much Tv) or the Prius (I do love it, but I could live with­out it)… so I’m going to split the dif­fer­ence. 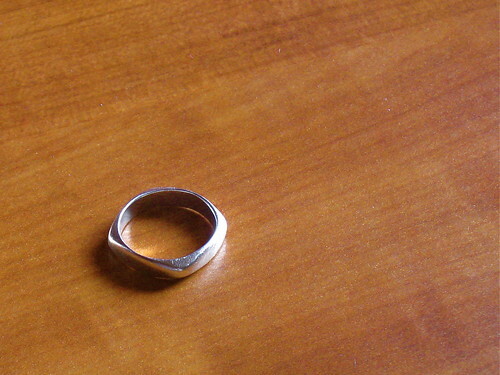 My favorite pos­ses­sion might well be my sister’s ring. We were in Strat­ford, Ontario, attend­ing the Shake­speare Fes­ti­val there. My sis­ter lives in NYC, and she showed up wear­ing a cool lit­tle ring. It’s small, sil­ver, and squared off. Not square, but more the shape of an old cath­ode tele­vi­sion. I com­ment­ed on how cool it was. She said she’d bought it at Bloomingdale’s, and then, right there, took it off and gave it to me. I wear it every day, and love it. We used to share an apart­ment in New York, she and I. I miss her, and the ring reminds me of her. I think it looks good on my lit­tle fin­ger next to my wed­ding band. Since then, I’ve often thought that I should com­mis­sion my two oth­er sis­ters to get me oth­er jew­el­ry, so I can wear some­thing from each of them. But I’m so damn picky, I may need to send them a URL or some­thing. Kind of detracts from the spe­cial­ness, no? So. Here’s a pic­ture of the ring. The Intar­webs is a great tool for find­ing peo­ple. I used to work for the Amer­i­can Col­lec­tors Asso­ci­a­tion (and no, they don’t col­lect stamps), so I should know. There are a lot of peo­ple from way back when who I am curi­ous about. Friends from 1st grade, ele­men­tary school, high school, even after col­lege. with whom it would be fun to recon­nect. Sure, I could stalk them, but I’m lazy. So instead, I’m putting their names on a web page, for them to find when they do a lit­tle ego­surf­ing. Because, come on, who hasn’t indulged in a lit­tle ego­surf­ing? Should my little kids carry ID? So, a lot of the stuff I’ve been read­ing about child safe­ty sug­gests that your kid should have some sort of ID on him or her. That is, a pho­to with some basic con­tact infor­ma­tion on the back. That way, if they get lost, or (God for­bid) hurt, some­one can get hold of us. Tar­get gave us some stick­ers and safe­ty info with a recent pho­to order. They sug­gest the whole recent pho­to, CD, info, etc. route we’ve already tak­en. But they also sug­gest, in the case of evac­u­a­tion or emer­gency, giv­ing your kids an index card with their basic info on it. If you get sep­a­rat­ed, they say, that info will help bring you back togeth­er. So, I thought, what about hav­ing them always car­ry that info around? Like a kid ID card. Ini­tial­ly, I was a bit leery about it because of the stranger-anx­i­ety thing. You know, you don’t put your kid’s first name on his jer­sey so strangers can’t call it out and act all chum­my. But real­ly, if my kid’s been (God for­bid) abduct­ed, an ID card isn’t going to make much of a dif­fer­ence. Then I thought, how para­noid do I have to be to make my five-year-old car­ry (what is essen­tial­ly) pho­to ID? Not like I had any iden­ti­fy­ing any­thing with me when I was grow­ing up. Not like my kids are ever any­place with­out an adult. And where would he car­ry it? He would leave his shoes at home (and he has) if we didn’t remind him to put them on (and we didn’t, that one time). And then, the two year-old? What would we do, stick a FedEx return stick­er on his back every time he leaves the house? But the thought of them alone, with a (nice) stranger… scared… cry­ing… just one para­noid par­ent away from hav­ing phone and address at hand… the five year-old can prob­a­bly mem­o­rize our phone num­ber, but the two year-old can’t. So, what do you think? Kid ID, or phone num­ber tat­too? You’re watch­ing your hour-long drama/mystery/police pro­ce­dur­al show on tele­vi­sion, and your heroes engage in con­ver­sa­tion with a hith­er­to unknown guy or gal on the street, who just hap­pens to be hang­ing around. Giv­en that speak­ing parts pay much more than stand-around-and-nod-silent­ly parts, you can bet your sweet plot­line that the guy or gal had some­thing to do with the drama/mystery/dead guy. It’s a dead give­away, but what are you going to do? Spend more to have a lot of red her­rings jab­ber­ing away? I don’t know. Do you have any sug­ges­tions? Anyone have a SmartMedia card reader they don’t need? I had for­got­ten all about Smart­Media, the flash stor­age for­mat that pre­dat­ed Com­pact Flash and SD cards. Until I unearthed our first dig­i­tal cam­era, the ancient Olym­pus D-490 ZOOM. Popped a few AA bat­ter­ies in it, and it fired right up. So i gave it to our four-year-old, and he took a bunch of pic­tures, then in the process of not putting it on my desk like i asked him to, he dropped it. Now I am left with a hunk of met­al and plas­tic, four per­fect­ly good AA bat­ter­ies, and a Smart­Media card with price­less works of art (or twen­ty-four pic­tures of the floor, I don’t know). I am pret­ty sure i don’t have a Smart­Media card read­er any­more. The cam­era is too old to have a USB port. It came with a ser­i­al port cable. The com­put­ers in the house are too new to have ser­i­al ports. New card read­ers are too expen­sive to use just this once (since the cam­era is toast). So any­one got a Smart­Media card read­er they don’t need? Or know where I can get bor­row one? Thanks. Nev­er did get in on the beta, but Friend­Feed has just launched. Essen­tial­ly, it’s a feed aggre­ga­tor for all the ser­vices you use. You attach your Friend­Feed account to your var­i­ous ser­vices, and it lists all the updates you make. That way, your friends can sub­scribe to one place to fol­low all your doings on the Intar­webs. Be my friend, won’t you? And here’s the feed. Free child safety kit: how can you not? More gems from the stack of stuff res­cued from the base­ment: a child ID card for my old­est son, from a school pic­ture tak­en two years ago. Got me hunt­ing around on the Inter­net for info and resources, and I found this Dura­cell-spon­sored child safe­ty site with info, pdfs, and a “take a recent pic­ture of your kid” email reminder ser­vice. Essen­tial­ly, you should have a recent, head and shoul­ders mugshot of each of your kids, avail­able in a dig­i­tal form (on CD), and at hand. We didn’t, but we will by tomor­row. Do you have one? Mark tagged me for a meme. Pick up the near­est book, turn to page 123, and post sen­tences 5, 6, and 7. The near­est book to my com­put­er is… (get­ting tape mea­sure, as book­shelf 1 is about as close as book­shelf 2)… well, they are both with­in the mar­gin of error, so… I give you two books. I nev­er could stick to the direc­tions. It was a prob­lem in col­lege. I’m also not going to tag any­one, because, while I rec­og­nize that it can be fun, Mark tagged all the peo­ple I know with a blog (sad, isn’t it?) and plus, I don’t do that sort of thing. What a piss­er I am. Feel free to do this on your own blog, com­ment on my books, or post your own Page 123 entries below. Watch­ing the Oscars last night (at TiVospeed) I was hop­ing for the suc­cess of Michael Clay­ton, one of the few movies I’ve seen that I would like to see again soon. Now that I’ve seen the plot, I want to watch the act­ing, the cin­e­matog­ra­phy… it was that good. Til­da Swin­ton did win, and it was well-deserved, but the movie got short­ed in the oth­er cat­e­gories. Oh well. Here are the notes I wrote down after see­ing the movie last Octo­ber. I haven’t seen the two big win­ners of the night, There Will Be Blood and No Coun­try for Old Men, but Michael Clay­ton stands out to me as a fine bit of moviemak­ing. I should real­ly see those oth­er movies, though. What did you think of Oscar night? This won’t be much of a shock­er for peo­ple who know me and know dwell mag­a­zine. I like to style myself a designey, mod­ern, cool-stuff kind of guy (and I am, real­ly), so I nat­u­ral­ly thought dwell would be for me. I sub­scribed, cheap, and got a year’s worth. This last week, I man­aged to read (flip) through the accu­mu­lat­ed stack. All the design and homes and archi­tec­ture are way too stark and mod­ernist for me, but I active­ly cov­et a lot of the stuff in the adver­tise­ments. This is the kind of mag­a­zine that has ads from Room&Board, Porsche, and BDI, as well as a slew of fixture/kitchen/counter design com­pa­nies I’ve nev­er heard of, prob­a­bly because I’m in the wrong tax brack­et. Do you read and like dwell?